Yogesh completed his PhD in chemical and biological engineering at Princeton where he worked on studying how the dynamics of chemical signals control animal development. Now at Penn, he is shifting his science into single cell biology, aiming to understand how cells are organized and communicate in response to pathogenic perturbations. The focus of Yogesh’s current work is understanding drug resistance in cancer cells. He wants to find out why a rare subset of cells are able to survive longer than others even when in the presence of drugs that should kill them. 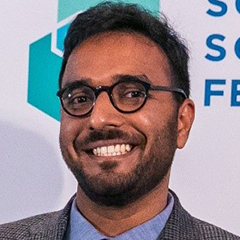 Yogesh’s science has the potential to improve cancer therapies and provide insights into the basic understanding of origins of resistance in various disease contexts. Yogesh is passionate about crossing boundaries and working with all types of disciplines. Hailing from rural India, Yogesh is not only a first-generation high school, college, and PhD graduate, but he is also the first in his family to travel abroad for his studies. In addition to working at the intersection of engineering and biology, he is also passionate about working with artists and poets, and advocating for art and science partnerships in research and teaching. Yogesh has personally worked with artists on several projects and recently published on the evolving relationships between art and science. Read Yogesh’s blog on the 2018 Oxford Global Meeting – ‘A rare opportunity’.